Captain Todd Jones is a professional light tackle and fly fishing guide serving Florida's Panhandle from his home base of Panama City Beach. Captain Todd is also an expert hunter who can guide you to the best duck hunting on Floridaâ€™s Gulf Coast. He's also a local guide with the extensive local knowledge necessary to make your fishing trip successful and memorable. Located in Panama City Beach, Florida, we fish and hunt the pristine waters of St. Andrews Bay and surrounding waterways. St. Andrews Bay offers endless inshore fishing opportunities for redfish, tarpon, trout, pompano, Spanish mackerel and sheepshead. We can pursue these critters using bait, artificials or even fly rods. All tons of fun and comfortable, while in the sheltered waters of St. Andrews Bay. The environs of the bay also offer an unspoiled view of Florida's other flora and fauna. If you prefer a bigger challenge, our boat is capable of safely and comfortably going offshore in search of larger gamefish like: snapper, grouper, king mackerel, cobia, amberjack or even the occasional dolphin (mahi-mahi). In fact, since we got our new boat, offshore fishing trips have been some of the most productive and enjoyable fishing trips. The Panama City Beach area offers some truly extraordinary fishing opportunities. There are few places on earth where you can see huge schools of feeding redfish, or swarms of hungry speckled trout. It's no wonder these piscatorial prospects draw visiting anglers from all across the country and the world. No matter your fishing experience, Capt. Todd's mission is to make your fishing trip a success for YOU. 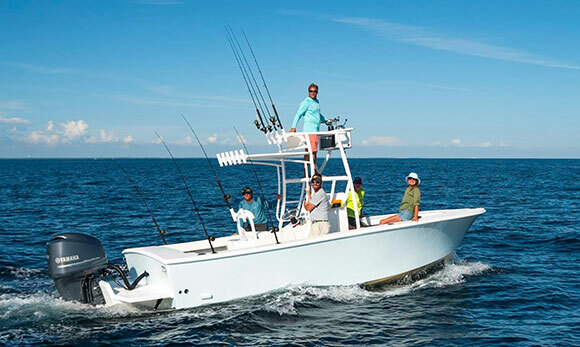 The captain can cater your fishing charter to your skill level and specific desires. Whether you're a first timer casting to a school of tailing redfish, or a seasoned angler wanting to live bait for trophy kingfish offshore, Capt. Todd will make your excursion a memorable one. Like any good fishing guide, Captain Todd loves what he does and draws great personal satisfaction from watching his customers catch quality fish and enjoy their time on the waters of Panama City Beach.